This book is written by Roger Herman and Joyce Gioia (Oakhill Press, 2000). Get the best workers to consciously choose to work for you-instead of joining your competition. Become an “Employer of Choice®.” As the labor shortage intensifies, competition for qualified, dedicated employees will become even more challenging. In our strong economy, people have choices of where they will work. Learn how to inspire workers to choose you. This book has the secrets! 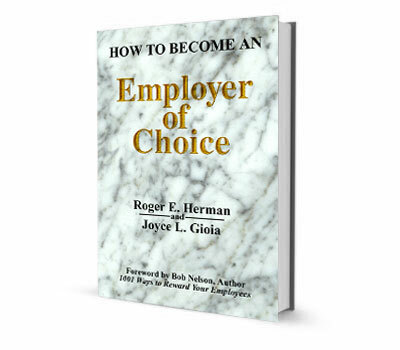 Why Become an Employer of Choice®?